Written by Sarah Adams, directed by Mike Heath. I probably went to this production in the wrong frame of mind as I remember the Joshua Brooks pub as something of a student haunt rather than a venue for quality theatre. And as this seemed to the first full production from the 'By The Slice' theatre company, I really wasn't expecting much. Perhaps I should research more into the actors performing, and the theatre company behind a production before I jump to such conclusions in future! My preconceptions of Joshua Brooks being a venue dominated by students, was based on drinking there some ago, hmm (cough) some 20 years ago actually. As the performance start time approached and the bar started filling up, it became apparent that this was a more mature and refined looking audience than I had expected (like my good self actually), and this started me wondering if I had perhaps underestimated the level of performance I was about to see. Descending the stairs to the cellar-like venue, I could feel the excitement from the crowd already assembled, and was extremely surprised to find a perfect little theatre set-up with professional lighting, sound equipment and cosy, intimate lay-out of the seating and stage areas. It also doubles as a night club area, but as a small theatre it was packed (as I believe the 2 previous night's performances were) and the atmosphere was great with everyone relaxed and chatting. 'Call Me!' is billed as a 'One Act Comedy' which follows three women: Natasha (Sarah Adams, who also wrote the play), Cheryl (Christine Clare) and Clare (Sohpia Hatfield), exposing their cringe-worthy journey through their relationship mishaps. Fed up with their bizarre relationships they accidentally decide to visit Sandy Morris (Rachael Priest), founder of the "Love Yourself To A Love Life Worth Loving" movement - a kind of a hippie Luuurrve Doctor, complete with canapés and mystic bunting! Alongside the three women, we are also introduced to Jenny (Laura Cope) and Mike (Matthew Stead) who are 'hung up in a world of plans, tactics and rom-com aspirations, whose love story lacks convention'. The question asked is whether these two will become a success story of the unexpected - or will they too become the next two attendees of Sandy's self-styled love healing sessions? With the scene set, we are introduced to the characters of Natasha, Cheryl and Claire one by one. We eavesdrop on telephone calls by each one, conducting one-way relationships with their boyfriends' (ex or otherwise!) answerphones. The consequences are absolutely hilarious and the script is spot-on, fast, hilariously funny and extremely fluent, including some close to the bone, and sharply accurate depictions of various relationship situations that I am sure we have all found ourselves in at one time or another (well, I'm admitting to 2 at least - but not saying which ones!!!). Speaking to writer Sarah Adams afterwards, she explained how these individual characters and their telephone conversations were produced as separate monologues, and later combined into this superb play. The monologues worked very well on their own yet you yearned for the women to get it together and have a good old chin-wag about what should be done. The performances of each actor were as tight as could be, and seemed like the characters were written for the actors as they were so totally believable. Not seeing the boyfriends linked to Natasha, Clare and Cheryl worked well and allowed the audience to imagine their ex cheating (etc etc) boyfriend's faces. Although I must confess when Natasha finally meets up with Derek in the coffee shop and she walks to the front of the stage, I am intrigued to know what kind of bloke gets her sooo flustered, but as we never get to see him we are left wondering, which was fun. The scenes with Jenny and Mike were tender, touching and utterly believable and I did find myself "rooting" for them, and their timing was superb. The production as a whole was one of seamless perfection, resulting in a laugh-out-load comedy that hit home with the audience, and I haven't laughed so much in ages. I cannot imagine that even the most renowned theatres out there could have put this together any better! I also find it hard to believe that this is the first play written by Sarah Adams who plans to produce her next play "In Quiet Places" later this year, and if this first one is anything to go by, then I can't wait! The only real criticism of the play is probably explained by the way the characters in the early monologues were brought together by a third party 'professional' facilitator - a character society is becoming more familiar with by the day. The character and the scripting were absolutely spot on and even tighter than the monologues if that were possible, but it was rather the fact that the women's relationships were brought to life and allowed to flourish only with official sanction. It was funny though that in this climate of Nanny State knows best and widespread aversion to anything even slightly risky, that although the three women sought the help of a counsellor to discuss and resolve their problems rather than each other, it was the counsellor (Dr Luuurrve Sally Morris) who actually advocated that they should all TAKE A RISK on love. Way to go Sally - forget all that lovey dovey stuff, and get on with living! Editor's Note: Are the Arts having a renaissance? Well if you want to discuss this particular topic you should come along to the Manchester Salon on Monday 10 September and join in trying to answer the interminable question of how we contemplate art today. Also, By The Slice have managed to get Call Me! 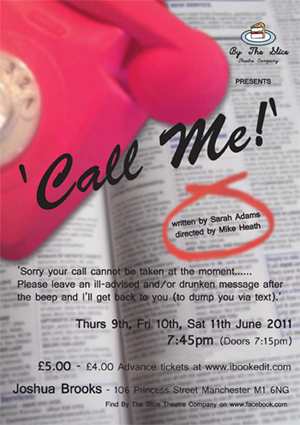 put on at the Edinburgh Fringe Festival from 2nd to 26th August - see http://www.edfringe.com/whats-on/theatre/call-me.